The Can Opener Boy Translations: Hello God, is that You? Hello God, is that You? Over the past few years, I have occasionally been awakened (for no apparent reason I can think of) at 3:00-ish am. Maybe it has been 3:30-ish am, I'm not sure. When it has happened a few times over a short period, I've wondered about it. Maybe I'm supposed to pray for one or both of my two friends who have both told me they sometimes wake up at 3 for no reason, sometimes with back pain, sometimes with worries, etc. I think this waking up at 3:30-ish happened a few nights ago. And it happened again this morning, but this morning it was different. I have some friends who know stuff about numbers and their meaning in spiritual things. They're often quoting number meanings, like "8 is the number of such and such" or "11 is the number of thus and so" While I have never discounted these concepts, I have also intentionally not delved into them at all. Not because I think they are bad or anything. It's just they are not "the main and the plain" of living wiith Jesus. I like to stick to the main and the plain, so I haven't gone looking for God in number meanings. But what if God comes looking for me there? See, this morning it was different because I looked at my watch and it was a little after 3:30. I don't have a digital watch, and I didn't look at the digital clock on the bedside, but I wonder if it was 3:33? Even if I had looked at the clock and it was 3:32 or 3:35 or something, that would not have mattered to me. What mattered was I felt God's presence with me. Not weird or strong or anything -- not dramatic. Just there with me. A friend recently made a comment to me about holiness. He said it wasn't so much about being absolutely and forevermore sinless ('cause I can't really do that here on this side of heaven). He said holiness was more about being true to who I am. Like, becoming fully me. A tree is holy and worships God because it is what He made it to be, and does what He made it to do. So I become more holy as I become more like Jesus and become the person He intends me to be. I like that idea a lot. "the dog I've been feeding all week is the one who will have enough strength to beat the one I've been starving all week"
I have been feeding my false self for a long long time, and I want to stop. I want to start feeding my true self -- and become the man God intended me to be all along. It is known (from years of scientific research in the fields of medicine and psychology) that children who are in horribly abusive situations dissociate -- they somehow separate from reality in order to avoid pain. It is a survival tool, a defense mechanism. So the child being beaten "sees" himself receding into the wall behind him and, in this way, does not feel the beating. A sort of false reality is set up where the child retreats for safety. I think all of us have pain, and we all try to retreat from it and avoid it. I am learning the only way to heal it is to feel it and move through it with Jesus. I think we all have a false self -- the sin nature inside us, or the "old man" Paul talks about having been crucified with Christ so the "new man" can be raised with Christ. "When I was eight, the impostor, or false self, was born as a defense against pain. The impostor within whispered, 'Brennan, don't ever be your real self anymore because nobody likes you as you are.'" "Living out of the false self creates a compulsive desire to present a perfect image to the public so that everybody will admire us and nobody will know us." "Sanctity lies in discovering my true self, moving toward it, and living out of it... While the impostor draws his identity from past achievements, and the adulation of others, the true self claims its identity in its belovedness. We give glory to God simply by being ourselves." Jesus lead me out of fantasy. Jesus lead me out of lies. Jesus lead me into Perfect Truth. Jesus lead me into Life. Another thing: a number of years ago, I woke up in the middle of the night (who knows what time it was) and sat on the couch and talked to God. I felt led to go read Samuel and was struck with the impression from God that He was saying to me "You are a Samuel". I had no idea what to do with that (it could mean so many different things!). But it comes back to me now and again. This morning it came back to me in light of the story of Samuel, where he listened for God. I think if I wake up again at 3:00 or 3:30 or 3:33 or any time in the middle of the night, I'm not going to trip on what the number three means, but what I will do is grab my journal and bible and go sit on the couch and say "Hello God, is that You? I belong to You, and I'm listening..."
3 represents the trinity and since you are seeing 3s regularly it usually indicates that that you are going through a time that is not particularly clear. This is God’s fun way of saying that He has you covered. It is also interesting to note that in Theomatics, the Hebraic study of numbers and how they correlate with letters of the Hebrew alphabet, numbers are often added together. 3+3+3= 9 which talks of the fruit of the Spirit. I have noticed that people who are seeing 333 often are being called to a higher level of evangelism. 9 is the number of the evangelist in Theomatics. Anyway, I am seeing 11s, 1:11 and 11:11 which indicates transition and a greater release of the prophetic. I agree with Doug’s post… Here’s my input, I hope it helps. 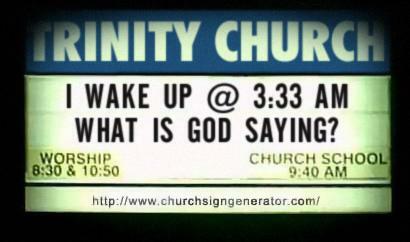 I recall waking in the middle of the night with a sense that it was God and he wanted to talk. The problem was - I was very comfortable under my blankets and did not want to get up. After a few minutes, realizing that he wasn’t backing off I got up, went to my study and complained to God saying something like “You know, you can speak to me in the daytime if you want to”! To which he replied, “If you paid attention in the daytime I would”. Ouch. Sometimes God speaks to me at night because I’m too preoccupied to pay attention to his voice during the day. That’s the NIV; you might enjoy checking it out in the Message and Amplified as well. They seem to apply well to your last paragraph. You are finally opening doors that have been shut for a long time and exploring parts of yourself you either had forgotten about or didn't know existed. Heart Change was the beginning, but certainly not the whole story. It's been a process and will continue to be one. There are parts of God that you haven't yet explored either - obviously - just like you and HCWB are continually learning about one another and exploring depths of who you are individually and as a couple. God does speak to you. Has always spoken to you. He is now beginning another part of the journey and calling you to a deeper place in Him. I agree that you shouldn't dwell too long on the specifics, but rather just realize that God is much larger than previously thought and He's calling you into greater intimacy. He may do this in unexpected ways, because He's God and He needs you to see that. There is a time and a season for everything. Good luck on the next leg of your journey. There is abundant provision for it. I love you! !